Come out of the musical closet with Brian & Erika! 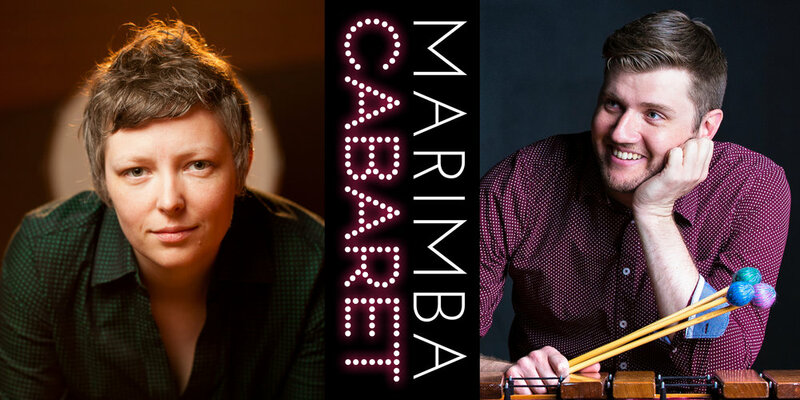 Marimba Cabaret is what happens when two classically-trained percussionists with a love of showtunes and shoes put on a show. Brian Calhoon embraces his love of karaoke, marimba and heels, while Erika Johnson loves arranging awesomely bad songs for percussion and her voice. Together, they present a dynamic show of musical theater, pop covers and guilty pleasures re-imagined for marimba, percussion and their voices. "What's a marimba?" Like a xylophone, but bigger and more fabulous -- just like Brian. ;-) Fresh off of performances in Boston, Portland, and Provincetown, don’t miss the D.C. debut at the DC Arts Center! Winner of the 2017 Critic’s Choice Award at PortFringe Theater Festival, audiences say Marimba Cabaret is "a fabulous time!" and “fun, unexpected, inventive, and full of heart!”. Guaranteed to make you laugh, cry, and sing along, there’s something for everyone in this eclectic evening of mash-ups and marimba covers. Brian Calhoon combines his experience as a percussionist and vocalist to perform a unique collection of music for marimba and his voice. In 2013, Brian made his stiletto debut as marimba soloist with the Boston Gay Men's Chorus during the Candelabra Cantata, opposite "Liberace" in a battle of dueling keyboards. Erika Johnson brings her unique voice and versatility everywhere, from cabarets to orchestral pits and stages. A singer herself, Erika specializes in accompanying voices through innumerable musical theater productions and cabaret. or herself and others, she arranges for the rare combination of voice and percussion. Her arrangement of Cyndi Lauper's Time After Time was recently premiered by New York City-based professional chorus, Choral Chameleon.